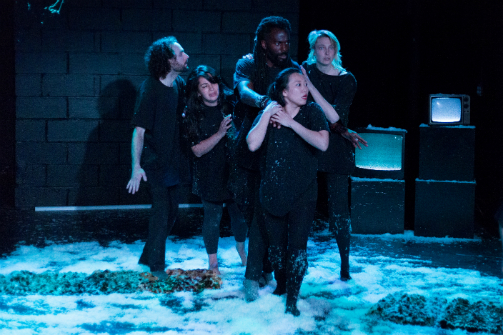 Brad Burgess, Leah Bachar, Equiano, Chun Cho, and Monica Hunken in Blind. Photo by Yi-Chung Chen. BOTTOM LINE: An ambitious attempt to connect abstract symbolism with performers' individual responses to the current political climate. Here’s the thing: whenever we see nameless characters with existential crises on stage, we assume that the playwright drew inspiration from Waiting For Godot. We can’t help it. But Beckett was not actually the progenitor of this dazzling linage of theatrical symbolism. The grandmaster of the much imitated and revered "two men and a tree" trope was Belgian playwright Maurice Maeterlinck, who started it all with his pioneering one act, The Blind (Les Aveugles), in 1890. In the original play, twelve abandoned beings with no particular characteristics try to figure out their present and future amidst apparent desolation. The Living Theatre’s production of Blind outfits the highly allegorical play with elements of the present, and explores in depth the relevance of the classic. With a diverse ensemble cast embodying the play’s dangerously generic characters, the production does an excellent job of reflecting the psyche of a blind mass, going through various stages of experiencing "The Tragical in Daily Life" (another Maeterlinck work). The atmospheric set by You-Shin Chen and the alluring and haunting soundscape by Yung-Chin Sunny Chang transform Theater for the New City’s subterranean space into a realm where times stands still. A perfect circle filled with pale snow (or ash, it’s probably meant to be ambiguous under Yi-Chung Chen’s dreamlike lighting), empty except for a few TV monitors in the back displaying constant white noise, reminds one of Murakami’s "Hard-Boiled Wonderland": you’re half apprehensive and half fascinated with its romantic melancholia. Blind goes beyond adapting the play for a modern audience by inserting the creative team’s own personalities. Director and adapter Dennis Yueh-Yeh Li hijacks the plot and splits the play into two layers: one follows the original story of the twelve characters (performed by an ensemble of six) waiting for the return of their savior, a priest they hope will guide them back to an island asylum; the second layer features monologues written by the cast, which connect the play to their individual experiences as theatre artists in the current political climate. Li’s apt direction makes it a natural process for the audience to follow the characters’ points of view: you are given just as much information as the characters, as they discover and navigate their situation. You become simultaneously an observer and sympathizer; you wait with the characters as if you’re just another one of the blind, but also feel as if you’re the one they’re waiting for, and the agitation gives you a sense of helplessness, as well as guilt for your inaction. The aesthetics of Blind are highly stylized, and the movements of the performers are ritualistic and meticulously choreographed, which fits both the religious context of the play itself, as well as the symbolic attributes of theatre as a sanctuary. The players are an impressive bunch, each bringing something distinctively personal to their otherwise faceless roles. Kevin Lynch brings an inherent innocence and childlike optimism to his character, as well as a desperation fueled with passion during the parts where the actor plays himself. Leah Bachar exudes a ferocious determination and an almost savage sadness. Chun Cho has a more reserved yet undeniably strong presence. Monica Hunken transitions between delicate and maniacal, extremely human and relatable. Equiano’s performance is like a volcano beneath a serene snowcap: his biting monologue about the danger of pigeonholed theatre is one of the most powerful moments of the piece, inviting a round of gasps from the audience. Lastly, Brad Burgess brings a distancing quality and vulnerability to his character in a way that’s most natural. The only issue with the performers might be that it’s not extremely clear weather the production is committed to the characters being blind (although Burgess does play blindness convincingly throughout the show). This ambitious production impresses with its intellect and imaginative presentations, yet its multiple dimensions also make the show difficult to digest. Each segment of the play seems to make a new and separate point, and while all of them are equally thought-provoking, they also weaken each other with a lack of clarity. The pace of the show also suffers at times as each of the characters follows the same sequence before taking center stage and becoming temporarily an "oracle," while another performs a movement solo. As the original play is already abstract and symbolic, the augmented layer seems unnecessarily cryptic. Blind is a layered piece, the earnest collective effort of its creators. If you’re looking for something light-hearted and entertaining, the play is not for you. But if you enjoy a debate on the human condition and interpreting reality through a scope of abstract symbolism, Blind is a feast. Blind is by Maurice Maeterlinck. Adapted and Directed by Dennis Yueh-Yeh Li. Set Design is by You-Shin Chen. Lighting Design is by Yi-Chung Chen. Sound Design is by Ying-Chin Sunny Chang. Assistant Director/Stage Manager is Toney Brown. With support from Ministry of Culture, Taiwan, and the Living Theatre. The cast is Leah Bachar, Brad Burgess, Chun Cho, Equiano, Monica Hunken, and Kevin Lynch.